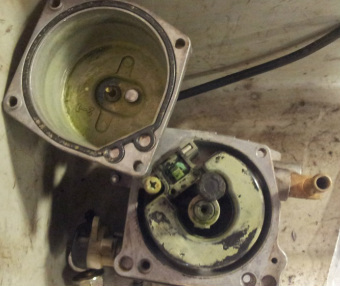 What is Ethanol doing to your Carburetor? This carburetor is from a new piece of equipment that sat at a dealership for several months with untreated fuel in it. It was purchased when the dealership went out of business and the machine came to us with running problems. Treating your fuel used to be a good idea, now its a necessity. See OPEI’s educational message about ethanol fuel http://youtu.be/OeIiYMLtGvg. Storing Your Lawn Mower for More Than 30 DaysIf you don’t plan to use your lawn mower for more than 30 days, follow these steps to reduce fuel-related problems. Storage Time: More than 90 days (long term or seasonal storage)Start the engine and allow it to run long enough to empty all the gasoline from the entire fuel system (including the fuel tank). Do not allow gasoline to remain in your lawn mower for more than 90 days of inactivity. Stale fuel in your fuel containerIf you have some fuel left in your storage container at the end of the season, the Environmental Protection Agency (EPA) suggests adding the gasoline to your car's gas tank (http://epa.gov/reg5oair/mobile/winter.html), provided your car's fuel tank is fairly full and the fuel is appropriate for your vehicle.